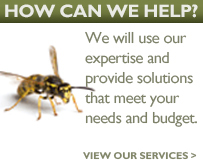 Pest control for home owners in the Northumberland, Newcastle and Hexham area. Northumbria Pest Control are the north east's experts on the eradication and control of bed bugs. You can read more about our bed bug treament service here.